The 9 to 15 July is the annual Bees’ Needs Week which is a great opportunity to find out more about how important pollinators are and how you can support them. 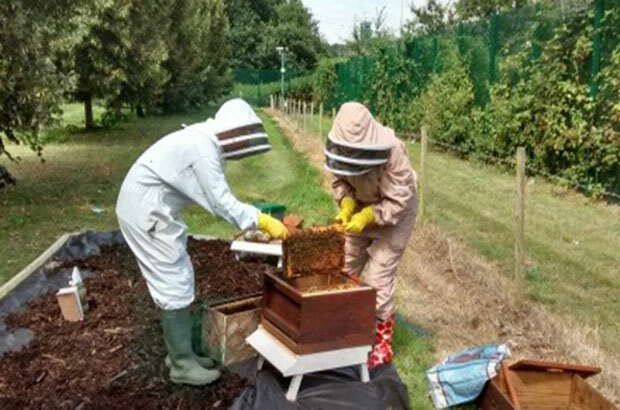 Mark Thomas, Scientific Project Manager, tells us how he has helped establish an apiary at APHA Weybridge. It’s not often you can indulge your hobby on site at work, particularly given the various biosecurity restrictions on the Weybridge site. However, back in 2016, as a new beekeeper I was keen to find a location for some hives, either close to home or work. I knew the Weybridge site was a good location, with plenty of space and good foraging. I then learnt that APHA’s CEO, Chris Hadkiss, would welcome having bees on site, so I began making plans. I made some initial enquiries and to my surprise I cleared hurdle after hurdle, including the biggest of them all - health and safety! I became aware that a colleague, Sue Bonsor, was doing a bee course and I shared my plan to establish an apiary on site at Weybridge. Along the way we recruited other staff and the ‘Bee Club’ was established. Now all we needed was bees! Sue and I headed over to Blackhorse apiaries to meet John, who was selling bees. He let us inspect the colonies thoroughly and I think he was a bit suspicious as he knew we were, as he put it 'from the Ministry'. Both the colonies we inspected appeared healthy, active and ‘queenright’, so the deal was done, or so I thought. We then moved indoors to complete the deal over tea and cake, where we were subjected to questions on our knowledge of beekeeping and what our intentions for the bees were. We had an interesting conversation and seemed to have passed the examination. 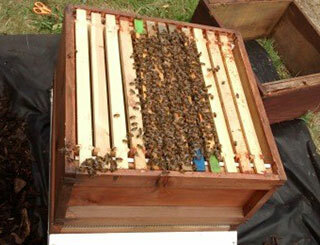 The bees were soon transferred from their temporary ‘nuc’ boxes into the hives. They were fed regularly on sugar syrup and both colonies began to build, and of course I registered them on Beebase. Both colonies continued to build, but it was interesting to observe their different characteristics given that they were both the same age and sourced from the same stock. Throughout the summer months we carried out weekly inspections on the bees to ensure there was a laying queen, sufficient food stores and space, but also whether there was any disease present. Both American Foulbrood (AFB) and European Foulbrood (EFB) are notifiable diseases, but there are other brood diseases to inspect for such as Sacbrood or Chalkbrood, as well as adult bee diseases such as Acarine or Nosema, though indicative signs might not always be present or easy to spot through a hive inspection alone. We also treated for Varroa mite which now affects most colonies to a degree so to minimise the effects we use Integrated Pest Management (IPM). This approach accepts that the hive will not be totally rid of Varroa, but attempts to control the infestation with various actions at different times in the year. The hives have a mesh floor so that the mites can drop through and a board underneath allows us to monitor the daily drop levels, indicating the level of infestation. We were also aware that as beekeepers we too can spread disease between colonies. We therefore ensured our suits and equipment were regularly cleaned and we did not share equipment with our personal apiaries outside of APHA. Soon it came time to get them ready for winter. I don’t know about other bee keepers, but I find it hard closing the bees up for the season, hoping they will survive over the winter until you open the hive the following spring. You feel responsible for the bees! Spring finally arrived and we were desperate to open the hive as soon as possible, but were conscious of the low temperature and did not wish to stress the bees. When the time was finally right we were pleased to see that both colonies were alive and healthy and the queens were laying. Both colonies began to expand and we stopped feeding the bees as the natural foraging became abundant. We added a super to both hives - this is an additional section placed on top of the hive with smaller frames, which the bees utilise to store honey. A queen excluder is put in place to prevent the queen going up there and laying eggs. The queen excluder also prevents the drones (male bees) that are slightly bigger than the female worker bees, from going up and eating the stores. The males just hang about the hive, eating, without helping with any of the hive chores. They are solely driven by the urge to mate, stopping only to eat the food prepared and stored by the female worker bees. I will leave others to make their own comparisons to the human world! At the end of the summer, both of the original colonies had grown and we were lucky to have our first APHA Weybridge honey harvest. This coincided with the centenary of the Weybridge site and we were able to sell centenary honey during the site celebrations. This also signalled the end of the season and both hives were fed, treated and closed up for the winter. The Weybridge bees are now in their second full year and the colonies continue to expand. 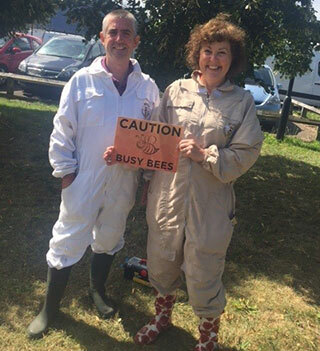 Back in May, Sue received a phone call to collect a swarm of bees. The swarm was contained and brought onto site where they were placed into their new temporary home, the new colony built at a rapid rate and was recently transferred into a regular hive. One of the original colonies then produced some queen cells, indicating, that it was preparing to swarm. We therefore carried out an artificial swarm, which involves moving some of the bees into another hive, effectively splitting the hive so one contains the old queen and one with the queen cell, from which a new queen will shortly emerge, thereby creating a new colony. This is the primary purpose that bees swarm naturally. Initially there was little change and this new small colony appeared to be struggling. However in the last few weeks we managed to spot the queen (not easy when she is not marked) and then saw that she had begun laying worker brood, which showed that she had been successfully mated. Hopefully the colony should now grow and establish itself. If it does we will end 2018 with at least four viable colonies. Fascinating article. I've tasted the honey and it's good! This is really an amazing achievement and really interesting to read about. If only we could taste the honey here in Carmarthen! Great work Bee Club ! Really interesting article. The honey is delicious - so much more flavour than the bland syrup in supermarkets. Well done Mark for the article and Sue and the newer members for helping establish the colony. I look forward to joining the Bee Club! These incredible little creatures need all the support they can get.